As a savvy traveler, you must have heard about opaque hotel bookings. Two most famous ones are Priceline’s Express Deal and Hotwire’s Hot Rate. These secret hotel deals may save you up to 60%. But there is a catch – the hotel name and precise location are not disclosed until you complete the transaction, which is usually not refundable. It is easy to understand. Hotels want to sell their time-sensitive inventory. But making those secret hotel deals public hurts their brand images. Furthermore, it would make it difficult for hoteliers to play “price discrimination” games with other travelers. However, not everyone can accept such uncertainty. If you rely on public transportation, you need to know if the hotel is close to a metro station or a bus station. If you self-drive, you don’t want to be surprised with an unusually high parking fee. Additionally, hotel facility condition and service quality vary significantly from hotel to hotel at the same star level, especially for those with 3 stars or less. So is there a way to find out the hotel before making the payment? Yes, there is. 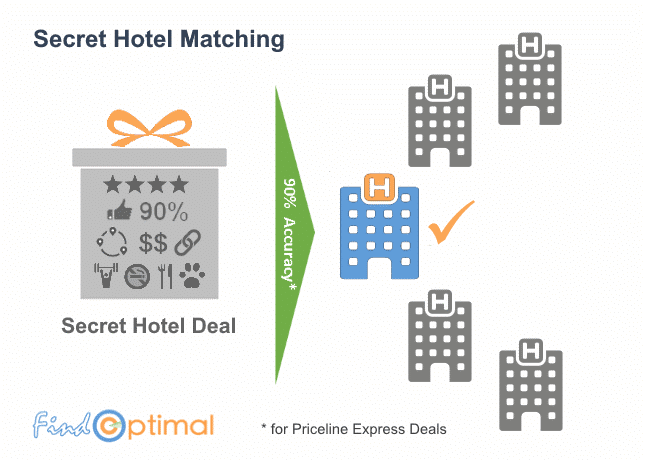 FindOptimal can help you reveal secret hotels provided by Priceline with above 90% accuracy. It can also narrow down the target with Hotwire Hot Rates to limited candidates. To help travelers make the purchase decision, Priceline and Hotwire provide the following information of the secret hotels – geographic area where the hotel is in, star rating, guest rating, percentage recommended (Hotwire), savings, top amenities and hotel chain examples. 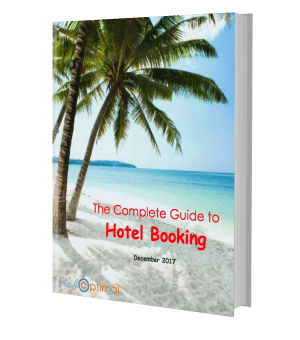 To identify the hotel, you can go to Priceline/Hotwire’s retail search or another hotel search site, type in a location, dates and a guest number, filter the star rating and guest rating, match hotel locations on a map, and then compare the hotel chain name and amenities one by one. You can also check the original price. Since Hotwire uses TripAdvisor’s guest rating, you also need to verify the candidates on that website. It is time-consuming to compare all above parameters, especially the amenities, of each property because different websites may use different standards for the ratings and different words for the same amenity. For example, we found that in many situations the same hotel gets 0.5 higher star ratings on Hotwire than on any other websites. Now, FindOptimal can do all those labor intensive work for you. You just need to type in your destination and check-in/check-out dates, and start a search. FindOptimal will show you all results including regular hotels and secret hotel deals. If a secret hotel deal is very attractive, you just need to click on “Reveal Hotel”. The identified hotel or all matched candidates will be displayed on the “Info” panel with a matching percentage. You may click the address to show the location on the map or click the guest rating to see all customer reviews, if available. With FindOptimal, you can enjoy deep discounts of the secret hotels with a peace of mind!